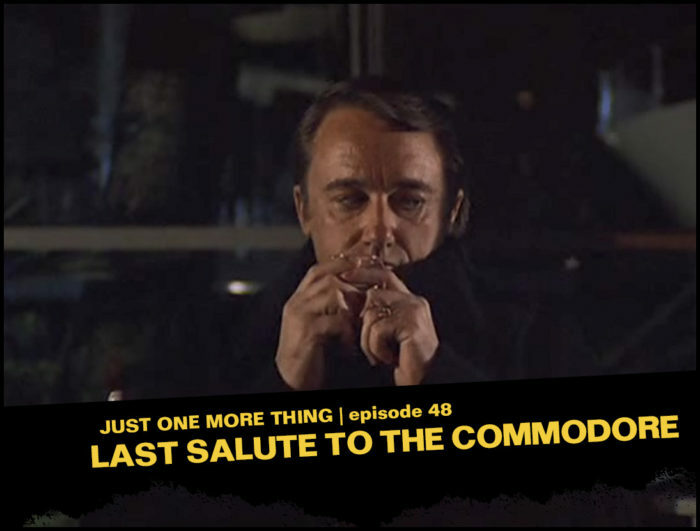 “Last Salute to the Commodore” is an odd episode of Columbo to be sure. The titular Commodore, owner of a luxury shipbuilding firm and head of a dysfunctional family, is found dead, presumably of an accident at sea. The prime suspect is conniving son-in-law Robert Vaughn. But wait! He gets killed, too? What? This episode is a whodunnit, complete with drawing room scene? Columbo seems drunk? He has a teen sidekick? He can’t stop touching Vaughn to the point of discomfort? There are shades of Groundhog Day, The Prisoner and Arrested Development? Sure! It’s all strange and actually kind of fun. Writer Christy Blanch is onboard to try and figure out how and why. I should say at the outset that this was a terrific JOMT episode, really a treat to listen to. Christy Blanch is a great guest, and I’d be thrilled if she would do another episode. It wouldn’t be a Vaughn episode, unfortunately, since you’ve already done both. As you said a few times, it’s an experiment. And the experiment doesn’t completely succeed, but it doesn’t completely fail, either. It’s just very, very different. So I wouldn’t say exactly that “Last Salute” is a bad episode; I just don’t think it can be judged by the same standards you’d use normally. It’s like one of the Simpsons “Treehouse of Terror” episodes, or maybe Tony Soprano’s fever dream sequence. Yes, maybe that’s it: it’s a fever dream Columbo. It was quite the eclectic episode. But a great show for you guys. For Robert Vaughn fans; check out Hustle, a British Cons out conning bad people show that features Vaughn as a senior grifter. I loved Hustle, but completely blanked on its name during the podcast. Thanks for mentioning it, though! I agree this JOMT episode is absolutely excellent and Christy is a fantastic guest! I loved the Robert Vaughn trivia round, knew barely anything about him myself but its always entertaining to hear people getting geeky. Interesting bit of trivia: Fred Draper appears in the next televised episode, “Fade In to Murder” playing an actor who muffs his line in a scene with Ward Fowler (William Shatner), who then instructs the director to get rid of him. Which makes Draper the only person to play the killer in one episode of Columbo and also appear in the subsequent episode. Never expected you to provide an overall positive review of “Last Salute,” but that’s the beauty of your podcast: it continually defies expectations, much as the episode in question did. I particularly enjoyed the theories posited for various interpretations of the subtextual narrative, which will make my next viewing (Netflix willing) that much more enjoyable. Great podcast. You are right – better episode the more I watch it. Christy was wonderful guest. Like the idea of Groundhog Day. Agree – was so odd – felt like in the middle of Columbo dreaming. Great podcast – a bit of off-piste goes a long way (I’m still chuckling at the Supertrain reference a while back), and the format suits this kind of (highly entertaining) rambling well. Still think it’s a ‘meh’ episode overall, but I agree with the prevailing thought that as the series was possibly coming to a natural conclusion – as the Columbo Phile states, all contracts were up at the end of the season – there may well have been an ‘end of term’ feel to the episode. I’m a big fan of Johnny the helpful scuba diver. I like him as much as Christy likes Robert Vaughan, maybe more.